For Us By Us… In times where clothing designers are attaching themselves to the heritage and culture of African Americans whether it be positive or negative (pending on your personal perspective) it’s great to see a line designed for us by us. Us being humans of color who know the experiences and challenges of being black, not only in America. It is also a time in society where people are being held accountable for their actions (#blacktwitter) and knowledge is obtained by either typing or talking to a computer for an answer. This access to information has also brewed a black conscious community who is very conscientious of their buying power and the need for the black community to buy black to be black. Similar to the days of Rosewood and the Black Wall Street folks are seeking outlets that support their own. With this in mind during the re-launch I reflected on of one of the most successful urban labels within the garment industry to date, that took the nation and world by storm growing from a shoestring budget of $40 to a $6 Billion fashion empire. I asked one of the owners, Daymond John if their launch during these times was intentional to bring a movement like before that exemplified the essence of urban? He humbly informed me that although their re-launch could not have happened at a more opportune time given the H&M, Burberry and Gucci fashion debacle their launch during these times was not intentional. Instead, he stated that the re-launch was the culmination of two years of planning. As I observed the familiar faces in the room their re-launch was about getting all the pieces and many of the original team from 1992 back for Round 2. 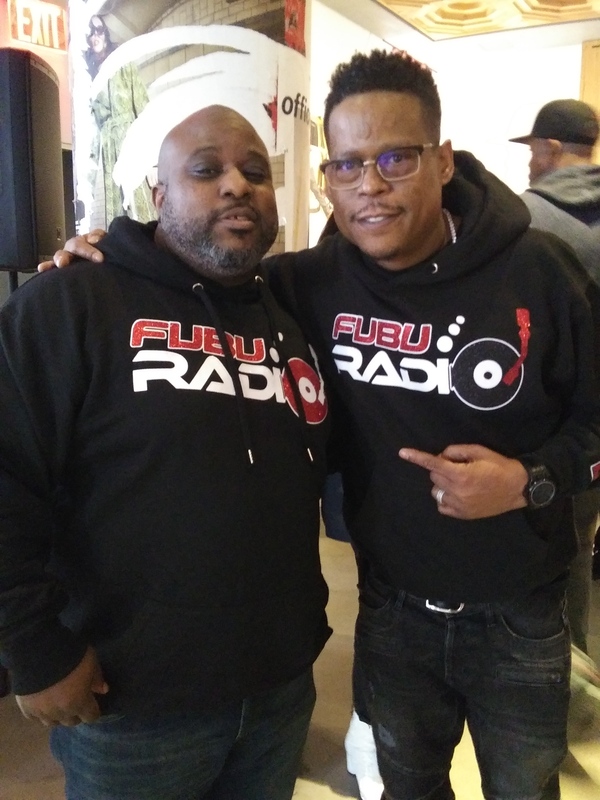 I must admit by the look of the racks after the event was over FUBU has not only re-launched but the FUBU train has pulled out the station. 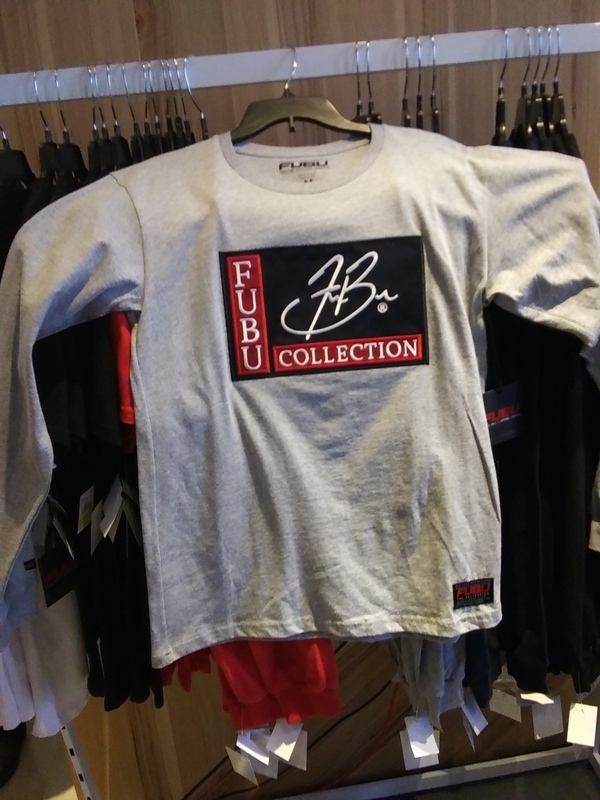 Just like all the merchandise sold that day, FUBU is moving and I dare to say is positioned to possibly clear out the competition once again. I know I bought a shirt not only because the price point was on point (Long Sleeve Embroided Embellished Shirt $39.00) but also I felt a sense of pride that warmed my heart to see us doing it again! Similar to the initial launch in 1992 FUBU had hats, hoodies, t-shirts and if you were media you received a FUBU branded phone strap to attach to your smart phone. A simple indicator that FUBU will not and never has been just clothes. Another founder, J. Alexander Martin stated so eloquently and succinctly why you wear FUBU; ” The collections are made for people who don’t want to stand out but rather want to be seen.”As you looked around the room that is exactly what you saw. The vibe in the room including the invited media, everyone had a posture of pride and elation. 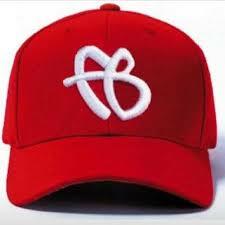 Over and over again you could hear consumers state how happy they were that FUBU is back. The capsule collection introduced 10 styles, based on classic pieces that redefined streetwear over 25 years ago. 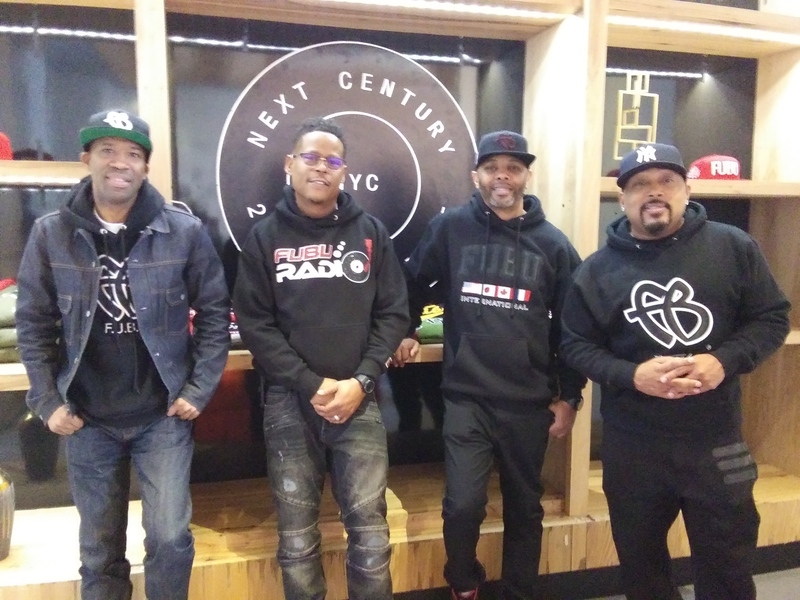 For more information or to purchase the line while supplies last go to Next Century who has the line exclusively or log on to http://www.c21stores.com or http://www.fubu.com. It’s always compelling when art imitates life. American Son takes place in a Florida police station in the middle of the night; a mother searching for her missing teenage son. 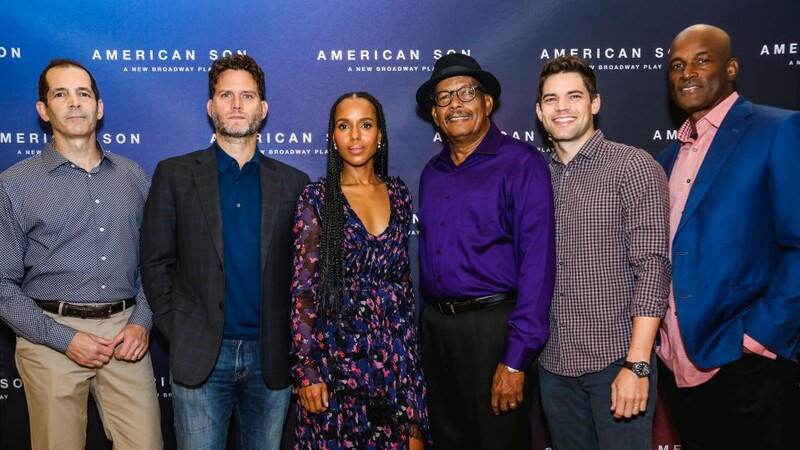 Kerry Washington and Steven Pasquale star in a gripping tale of two parents as an interracial couple caught in our national divide, with their worst fears hanging in the balance. Debuting with previews this month and opening night November 4th, American Son is an American classic play that gives the audience in the Booth Theater a first person view of the journey and experiences four individuals encounter in one night they all will never forget. Running until January 27th if you choose you have enough time to see it more than once. UBCTV’s new show; Urban Access got an opportunity to interview the cast, director and screen writer on their take of what to expect when we come to experience American Son. Our first interview was with Tony Award Winning director: Kenny Leon. 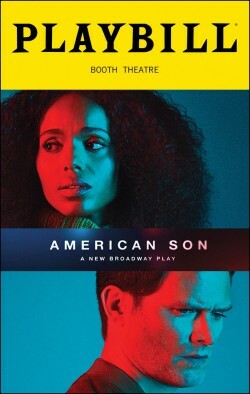 When I asked him what was the main reason why people should come to see American Son he replied: “Outside of a great story written by playwright Christopher Demos-Brown there are four main reasons that is going to make this play a success….Jeremy Jordan, Eugene Lee, Steven Pasquale and Kerry Washington. ” He went on to explain his excitement to direct this play due to the subject matter and as a director his opportunity to insight dialogue and contemplation on a pressing social issue through art. Next we spoke with the playwright Christopher Demos-Brown. He explained that, “American Son” is a story that derived from the state of American life and dinner conversations. 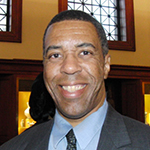 He has had friends who have had to deal with the issues of parents portrayed in the play. He further explained that this American classic is not only timely but also expressive in that the audience gets an opportunity to see different perspectives not just that of the main characters. Already awarded the 2016 Laurents/Hatcher Award for Best New Play by an Emerging Playwright, American Son is prepped to make its mark in Broadway history. One of the most fun interviews that day was with Eugene Lee. Its always great to have an opportunity to speak with experience. His posture and ease with the interview gave you insight on this seasoned veteran thespian. He spoke about how talent and a good story makes for greatness. He expounded on how the more they rehearse the more the story and characters are coming alive. He went on to express his exuberance and how he can’t wait until the final ingredient to a stellar performance… the audience. The interview with Jeremy Jordan was like none other. I guess due to his role/character Jeremy gave us more insight on the conflict and the struggle his character and anyone in his position goes through to find balance. He went on to explain that this play is a must see because American Son touches you. He eluded that if you have any sense of humanity this story line will leave with you when you leave the theater. I can’t wait to see it. Yet not because of who she is … nor the mere fact that I am a HUGE fan… Kerry Washington made you reflect on what it means to be black and a woman in American not to mention a mother. She went on to explain that Kendra her character is a women we all know. Her struggle is a daily struggle that the resolution to her dilemma is still unresolved. During the interview she made it clear that theater is different that TV. She explained that theater uses her whole body and there are no takes. Translated to delivery it’s total immersion and concentration compounded with a rigorous schedule. She went on to say that doing this play was a welcomed challenge. Yet the highlight of the interview for me was when Kerry spoke about her being a Bronx born lady and the history that borough created as the birthplace of hip hop. She explained that the hip hop pioneers showed by being resourceful and how utilizing that level of creativity inspired her and let her know as a creative it’s possible. UBCTV is bringing this and so much more telling our stories as only WE can do it. If you want to see the full interviews go to http://www.ubctvnetwork.com. Make certain to subscribe to our channel at https://www.youtube.com/user/UBCTVNETWORKS also follow us on facebook and twitter @ubctvnetwork so you can get discounts, invites and updates on what is going on to be a trendsetter like UBCTV! U B C’ing US! So stay tuned 4 Moore! As summer season begins less becomes more a necessity than a style. Women begin to search for products that will help accentuate less to make them feel better when they have to show more. First is the not so new but very popular Pilaten Pink Collagen Crystal Lip Mask Membrane Moisturizing. As the sun gets hotter the lips get drier. If you look at Youtube video reviews on this product a lot of vloggers state that this product will plump your lips. Although due to it moisturizing your lips that effect may happen, its not the main purpose of this product. Pilaten is primarily to reduce lip wrinkles, fade lip color, make your skin smooth and firm with increased skin resistance while resisting the external environment infringement. I don’t know about you but the constant application of lip balm is not in the summer. We tried the product and found that it did leave your lips feeling smoother however not as plump nor with any real noticeable difference in wrinkles around your lips. If you don’t mind leaving something over your mouth for 15-20 minutes it does leave your lips feeling smoother and softer. We rate this product …kissable! Next pick was a summer necessity…. between sandals, bathing suits, pictures at barbecues and pool parties grooming in the summer is very necessary. No one wants to have the memorable yet un-memorable picture for all to comment on unwanted hair. Andmetrics figured out a way to remove unwanted hair with out the messy wax or the expensive salon trips. Designed for men and women they have created a home grooming technique of waxing without the hot mess. Their line is ready made cold wax strips that remove hair from your lips, brows, toes and ears. (Yes, I said ears.) No longer do you need to wait for someone else to do your brows. The strips are curved to create a flawless arch. We tried the product and found that its great for maintaining a clean look. Yet if you were using it to remove a lot of hair you will find that you will need to use more product strips than desired. This product will save your wallet, time and trips to the salon you might find that once a month you will still need to get that wax or tweezers. Now as for the toes and ears this is the easiest way to maintain that metro-sexual look without the cost. It’s easy and relatively painless both for the pocket and the person. However don’t take our word try it for yourself and let us know what you think. The next product I loved for more reasons than one. No only is this a woman owned business but their company mission is to help hardworking people be more comfortable with less pain. Linda Gillette Parodi, a beauty industry professional and hairstylist with 20+ years’ experience in the field knows the pain and suffering caused by overworked hands and feet. Linda originally developed Parodi products to bring comfort and relief to her colleagues in the demanding salon industry. Today, Linda is dedicated to helping all hard-working people feel good every day, all day long. Yet what makes this product our pick is when taken to the test it passed with flying colors. Their nourishing foot cream and smoothing exfoliant help preserve one of the most important parts of your body; your feet. With over 7,000 nerve endings in your feet that connect to every vital part of your internal organs. Although for many,their feet are overlooked, this product helps you understand the importance of taking care of your feet due to the relaxing and soothing feeling you receive as your feet finally breath from these nourishing products. However the product that was most impressive was their comforting muscle lotion. As someone that is one their feet mostly all day once I applied the lotion with its roll-on applicator I felt relief of the tension in my muscles. The heaviness felt a little lighter. For anyone who is on their feet all day this is your secret weapon. The next two had more to do with looking beautiful than feeling beautiful like our previous products. The first from Los Angeles reflects the glitz and glimmer of the city of Stars. 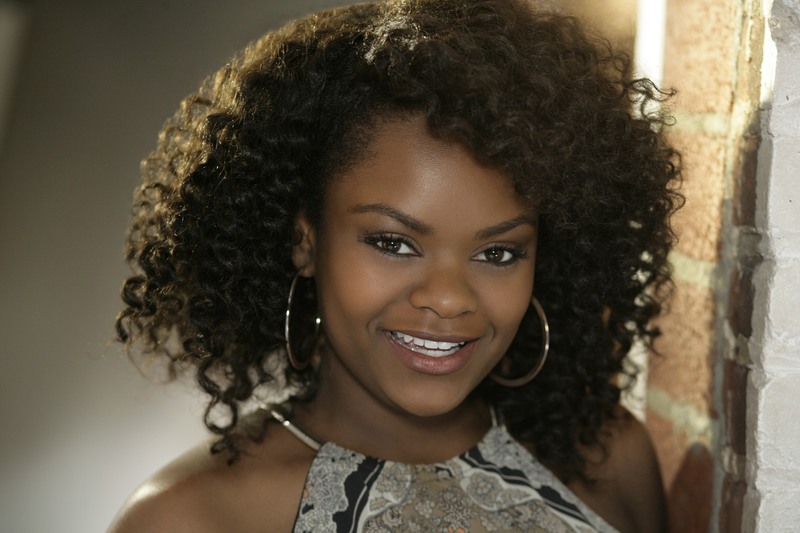 JCats Beauty is a full product line that focuses on makeup products that make you look like a star. 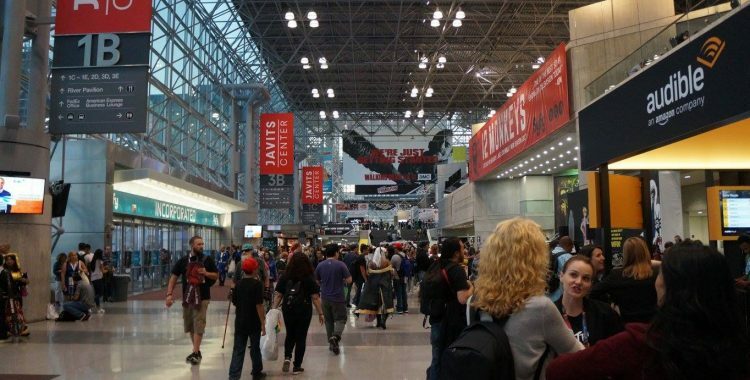 Their products are high quality with affordable pricing. They are known for their bold an vibrant color palates. Although recently their Gloden Soliel Baked Bronzer has kept them popular with beauty bloggers. This year they added products that pop such as their 3D-licious holographics lip cream and eye topper or their Pris-Metal Chrome Eye Mousse. Yet it just might be the You Glow Girl baked highlighter or the Aura Glow liquid highlighter that will be the summer favorite. Either way JCats is quickly becoming the cat’s meow. The last but not least of the top five picks is a familiar brand not only because of it’s innovative products but also its empowering business model that turn Moms into millionaires. Another women owned business Joni Rogers started SenseGence in 1999 and exploded into the marketplace with the launch of her patented LipSense color technology quickly taking the title as the creator of the original long lasting lip color. The three step process enables your lips to maintain its color for over 18 hours. First you apply the the color then the moisturizing gloss and then when it comes time to take it all off you apply the Ooops Remover. This is the perfect product for the pool party or the beach day. Your lips stay colorful and cute without the constant hassle of application. With an array of colors to many to mention you can apply a color to match every bathing suit.